Monaco is known for high-dollar big-rollers and is synonymous with pricey cars both historic and brand new. Perhaps, then, that is why there are a series of automotive auctions happening in concert with the Grand Prix de Monaco Historique event. Our old friends in the form of RM Sotheby's and Bonhams are showing up to the event with a scad of beautiful Porsche lots. This event is a big deal, and there are some seriously heavy hitters on the auction roster for this event. Here is a breakdown of our favorites. Grab a paddle and start bidding, if you can get on the bidder's list. With only six Porsche lots for Monaco, Bonhams is clearly focusing on other marques. That said, the ones they are bringing are exciting in and of themselves. Any auction that includes a 2.7 RS is always worthy of the attention of Porsche fiends, and this white example is no different. Toss in a gorgeous Rubystone 964 RS and a 997 GT3 RS 4.0, and you've got the ingredients for the start of a Porsche RS collection. If ever there were such a thing as a 'driver grade' Carrera 2.7 RS, it would be this example, and that's no slight against the car, by the way. This Porsche has traversed over 150,000 miles with its original engine and gearbox remaining intact. This is a rare French-delivered 911 with a sunroof and electric window operation. It's said to retain 95% of its original body panels, and has allegedly never been involved in any kind of accident in all those miles. The Porsche's entire history is known and spoken for, and it's been fitted with a few non-factory components that give this 911 a special feel. There are a pair of period-correct Recaro sport seats installed, a pair of driving lamps were fitted, an electric radio antenna was added, as well as a battery cut-off switch. The original yellow French market light lenses are included in the sale, even. This Porsche has been thoroughly checked over by 2.7 RS specialists Gaby and Gert Callewaert from Belgium, and they spoke quite highly of its condition. It was originally delivered to Sonauto, and is one of only four sunroof-equipped Porsches to have been exported to France. The car even retains its original Blaupunkt radio, jack, tool kit, and tire compressor. It's a highly original Carrera RS that you could purchase and immediately start driving on a regular basis. With as many miles as this car has racked up, adding a few of your own won't be to the detriment of its value. These cars were meant to be driven, so buy this one and drive it! Of all the open-top 356s, the Roadster's sleek and elegant shape has always struck me as the most attractive. As cool as an earlier Speedster might be, it's too unadorned and simplistic to be classically beautiful, and the shorter windshield doesn't look proportional to the rest of the car's dimensions. Based on a T5 B chassis, the Roadster is a compromise between the tall windshield of the Cabriolet and the low riser Speedster, the Goldilocks 'just right' height. Aside from all that, the later style of bumpers has always been my personal favorite. While the auction doesn't indicate and engine number or specification, the raised center caps would seem to indicate this car has the 75-horsepower 'Super' engine. Only 2653 T5 Roadsters were built, and a mere fraction of those were fitted with a Super 1600 engine. There is a lot to like about this blue chip collectible car. This Porsche was originally delivered to Inter Continental Motors in San Antonio, Texas. The prior owner purchased the Roadster in California in the mid-1980s, and had it shipped to the UK where it underwent a full restoration. The current owner, and seller, of the 356 was involved in the process of the car's restoration, and loved the Porsche so much he purchased it for his own in 1988. For the next thirty years the owner used the 356 for tours of Europe with his wife. The car has been displayed at many Porsche Club GB concours events, and has won numerous awards for cleanliness and originality. In stark opposition to Bonhams stunning lack of Porsche lots, across town at RM Sotheby's, there is a veritable buffet of significant Porsche lots. With a 959, a pair of RUFs, and a 914 racer, this was a really hard choice to narrow down to just a pair of favorites. Ultimately, a choice had to be made, and I've selected these two interesting Porsches to provide a bit more about. Here is one you may not have heard of yet. A few special 911 Turbo buyers in the 1980s were keen on adding a bit more power to their already terrifying (in period) Porsche. This upgrade package could be purchased from Porsche's Sunderwunsch, or through a handful of Porsche's worldwide distributors, and included a larger oil cooler, a larger intercooler, and a larger turbocharger. Further, the cylinder heads were swapped out for lower compression units to allow a huge increase in boost without pre-ignition. The best part of the kit, however, was a 935-style knob in the cockpit that could be used to manually adjust the level of boost your engine received. The Porsche's front valance was modified to accept the large oil cooler, but otherwise outward appearance remained unchanged. This particular example was imported to Sweden. VAG prepared the car post Porsche delivery, and the owner took delivery of their wild child Porsche at the Stockholm dealer in January of 1988. With fewer than 42,000 kilometers on the odometer, this 911 remains in surprisingly original condition. All of the factory literature can still be found in the glove box, even the invitation for the new owner to join the Porsche Club of Sweden. RM Sotheby's claims that 677 of these so-called J-program Porsches were built, and likely very few are presented in such original condition. Just looking at the image above, and tell me you wouldn't want the opportunity to tussle with this turbocharged beast. 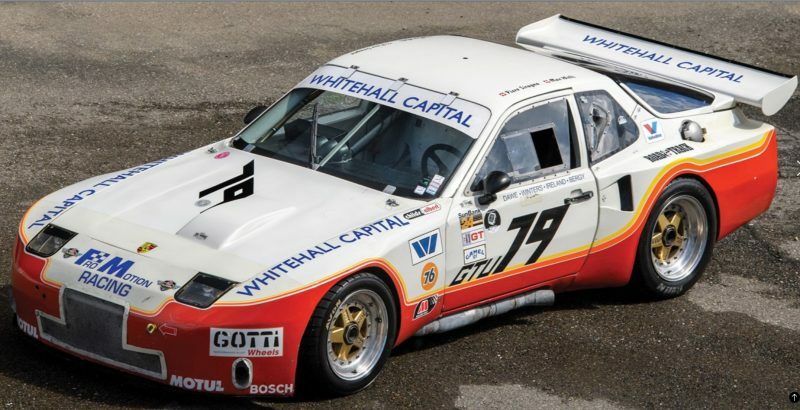 It was a strange part of Porsche's history when they started building 924 racing cars that were as fast or faster than some of their 911 race cars. With a few hundred horsepower more than a standard 924 Turbo, plus a huge widebody, and some not insignificant aero modifications, this is one of the craziest street-to-motorsport transformations since Porsche's own 935. Look at that huge turbo bulge, the giant NACA ducts, the sundown-stripe livery, and the anachronistically incredible center lock Gotti wheels, and you've got one of the coolest vintage racing cars on the planet. This isn't really all that historically significant of a car. It never won Daytona or Sebring or Le Mans, but it was campaigned reasonably successfully in IMSA sprint races, taking a handful of in-class podium finishes. It raced from 1982 through 1986, getting slightly less competitive with each passing year. It was a privateer car campaigned by privateer drivers. It was never fully up to the task of taking on factory-backed efforts. But that's okay, because you can get behind the wheel of this thing and give it hell at Rennsport Reunion this fall, or any other vintage racing event for that matter. The car has already been entered in, and accepted to, Le Mans Classic later this summer, so the car's new owner could race at Le Mans within months of purchase. In 2011, this car was treated to a complete restoration, and it shows. This is a knockout racer that you should definitely add to your collection.